After multiple truck rides, bus rides, and hitchhiking in a rice delivery truck, Sarah and I finished our pilots with seven participants in five different communities in the time span of a single week. It was filled with many long days and discussions, but it was an incredibly important process. Sarah and I have been developing a baseline survey for Ya’axche Conservation Trust for weeks. Our second lesson in collaborative conservation: Be patient. We’ve met with Ya’axche staff members on many different occasions to develop specific objectives of the survey and to discuss and re-discuss the best way to ask the right questions that will help us work toward those objectives. The Ya’axche staff members have helped us immensely by illuminating culturally sensitive aspects of the survey that we would have otherwise overlooked. We’ve also had multiple skype meetings with our advisor, Jennifer Solomon, to gather her input on working in different cultures. There are two sections within this survey that we took a more creative and participatory approach, inspired by our advisor’s unique experiences. First, we decided to create illustrations of the five farming practices that Ya’axche is promoting. These include beekeeping, backyard gardening, slash and mulch, inga-alley cropping, and cacao-based agroforestry. Because these terms may be confusing and ambiguous to the farmers and none of these farming practices have a direct Q’eqchi’ Maya translation, Sarah and I decided to use pictures that show what each practice looks like and have the participants point to the pictures to answer certain questions. Through the piloting process we were able to fine-tune this methodology. Our final survey asks participants to pick the two practices that they have the least amount of knowledge about and the two practices they would be most interested in adopting or expanding in the future. The other section we developed creative methodology for is also the most crucial section for our research. We want to understand what the most significant barriers are to adopting cacao-based agroforestry. In order to do this, we developed a five-point Likert scale that depicts different levels of agreeance. This scale is extremely Western, so we developed a paper ladder for the participants to point to different rungs that represent different levels of agreeance. Originally we had different smiley faces to represent each of the five levels. We quickly realized that these were not being interpreted the way we expected they would. The participants were interpreting the smiley faces as literal emotions, even though this wasn’t what we were asking in the questions. This is one way in which being flexible is incredibly important. After our first day of piloting, Sarah and I returned home (on the rice delivery truck mentioned earlier) and brainstormed different ideas to make this work. Finally we decided that thumbs up and thumbs down might be interpreted the way we wanted. This method worked better throughout the remainder of our pilots. This only describes a small portion of the incredible experience we had the past few weeks. We had the chance to interact with farmers in different communities throughout the Toledo district of Belize. At one household, the wife of the farmer was removing corn from the cob while we conducted our survey. 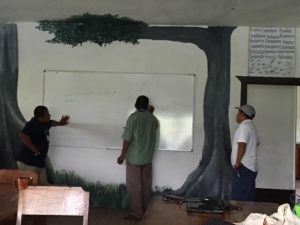 At another household, we sat underneath mature cacao trees and listened to a farmer tell us the story about his farm while answering the questions in the survey. 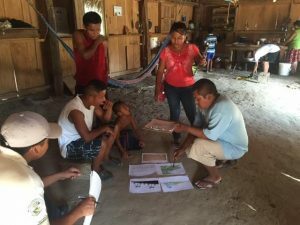 By doing the survey verbally, we are able to learn about the farmer through stories and have a greater understanding about the Maya culture that is so prevalent throughout Belize. The next portion of our project is to train three local community members in conducting this survey in the local dialect, Q’eqchi’ Maya, as they know the language (although we are learning a few words). Two of our survey conductors came out with us on our final day of piloting to begin to understand the survey and concepts of the project. They did a wonderful job and Sarah and I are very excited to have them on board! I will be leading a survey training at the beginning of September to help answer any questions they have and to ensure the highest level of understanding for our survey conductors. Stay tuned to see how it went! Cheers from Belize!